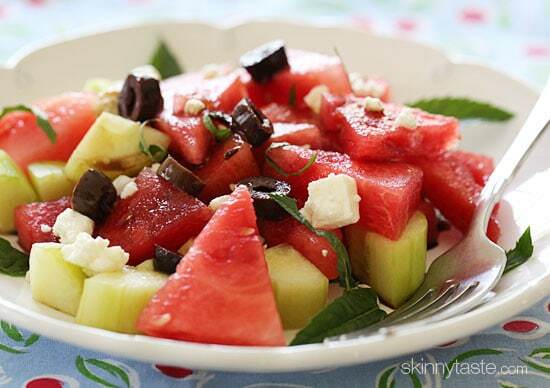 Salad with chilled watermelon and chunks of cucumber are tossed with feta cheese, Kalamata olives, fresh mint and a drizzle of balsamic glaze. It’s that salty-sweet thing going on here that’s so good – and will keep you cool as a cucumber during these dog days of summer. This is the ONLY salad I want this week; temperatures are going to be in the high 90’s all week long here in New York. During these sultry months, I usually make my watermelon salad with arugula, feta and red onion, but I loved this new combination with cucumber, mint and olives for an alternative, and a great way to use up any cucumbers you may have lying around. You can double this to make a big bowl for a crowd, or cut it in half if you want to serve two. This makes a great side dish to grilled chicken, or seafood. 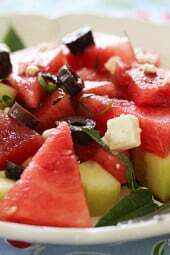 Divide the watermelon and cucumbers equally between 4 plates or in one large serving bowl; top with olives, feta and mint. Drizzle the balsamic glaze over everything when ready to serve. This is so good! I even managed to get the Balsamic reduction sauce right. Delicious summer salad! Surprise, Surprise, surprise, had all the ingredients except the olives. The salad came together very quickly. I was looking for something different for lunch, Instead of the mint I used basil paste and in [lace of the olives I used diced red onions. Salad was delish. I will be making this salad for lunch quite often. 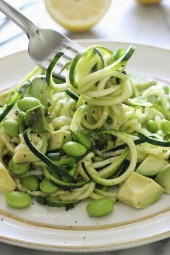 My new favorite summer salad!! I can't wait to try this. Had almost the same thing in a restaurant except they used pesto in it, I don't think there was balsamic because of that but if was delicious! yum! i am so in the mood for this right now. off to find me a watermelon! This was just wonderful. I added in little raspberry balsamic by mistake but it was great. This salad looks delicious, and so cooling. This looks delicious! I had a really flavoursome watermelon and chevre salad in Paris on the weekend. I think the watermelon had been infused with chilli and basil, it was really tasty! Yummy – this looks delish. 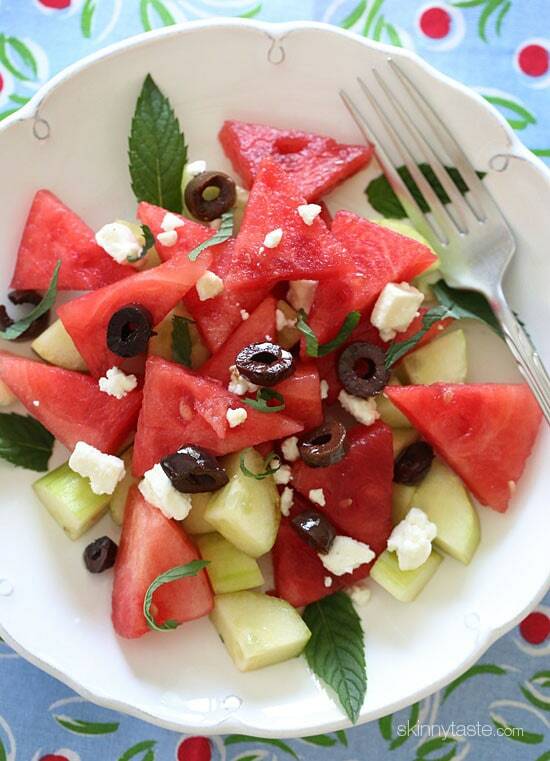 I love feta and watermelon together, nom! This sounds amazing! 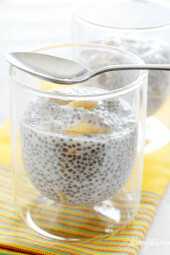 I have everything to make this tonight!! 🙂 I usually do a watermelon, basil, kalamata olive salad with grilled haloumi cheese and a drizzle of olive oil and lemon juice-I love the salty sweet goodness! Can't wait to make this one!! Gorgeous salad! Looks so light and refreshing! I have about sixteen little watermelons in the garden – this is on the list as soon as I have a ripe one or two! Bring vinegar to a boil in a small heavy saucepan; reduce to a simmer, and cook until thickened and syrupy, about 15 minutes. Remove from heat; stir in honey (if desired) and salt. Let cool completely before serving (glaze will thicken slightly as it cools). Gina. What is a balsamic glaze? Was it store bought or homemade? They sell it in the store next to the vinegars, I see it everywhere now but if you can't find it, you can simmer balsamic vinegar on the stove until it reduces and thickens. Gina – anything I could do instead of olives? My husband hates them unfortunately! yum this salad sounds so refreshing and good! You'll love watermelon in your salad! I cannot wait to try this – I can actually put a whole watermelon away myself, and the combo with the feta has me almost giddy with anticipation. I literally have all this stuff in my fridge ! Hmm, lunch tomorrow !! About the balsamic glaze, I just bought some balsamic vinegar, and it had a free sample packet of balsamic 'glaze' attached. Apparently you can buy it. I haven't tried it yet, but it sounds like something I would definitely like! I also found a recipe online and it consists of cooking balsamic vinegar and brown sugar. No need to add the sugar, it will thicken the longer it simmers. You can either make your own by reducing balsamic on the stove top until it thickens or you can buy it. Most full service grocery stores have it in the same section as balsamic/vinegar/oils. I was wondering what the balsamic glaze is also. I looked under dressings and there is no recipe search button that I can see. Thanks. I have tried water melon plus mint and water melon plus feta but never all 3 together！ Gotta try it out. Yes, the weather is getting ridiculously hot where I live too. 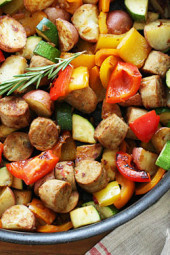 I feel a little silly asking this, but what is balsamic glaze? Do I need to make it or buy it? I was thinking the same thing… what exactly is a balsamic glaze? It's basically a balsamic reduction, they sell it next to the balsamic vinegar, or you can make it yourself. I buy mine in Trader Joe's but I see it everywhere. Yes, I work in a kitchen as a chef De Partie… All you do is take balsamic vinegar, and put it on med heat, stirring occassionally, until the vinegar "reduces" by about 50%…. so if you need a cup of finished dressing, heat up 2c…. it will get sweeter as it reduces, so watch and taste it till you love it! I keep seeing the watermelon and feta combo everywhere these days. I really need to make this. It looks so refreshing! Thanks for the recipe.